But for the prompter, many actors wouldn’t have reached their pinnacle of fame and fortune. I have seen many famous actors who wouldn’t say a single line on stage without the help from prompters. In USA, when theatre productions come from India with star studded cast, the prompters are left behind to cut costs. Local actors volunteer to prompt these famous stars of the easter years. But sometimes, unfortunately, age catches on to these senior actors and their hearing loses its sharpness. And this often results in a tragic situation on stage. The prompter yells at the top of their voice from behind the wings, while the actors echo them. This results in a cacophony that the audience needs to suffer. But I guess, these days prompters are also demanding their rights to be recognized. Few years ago, we were invited to perform our play by one of the north American organizations. 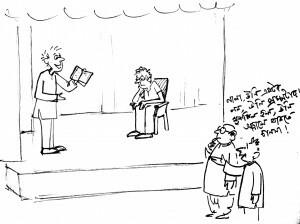 Before our play, the organizers themselves were scheduled to perform a play. From back stage we noticed that they had elaborate sets on stage. And behind each structure, there was a person with a copy of the script in their hands. On inquiring we were told that the director didn’t want to depend only on two prompters on the sides, but also wanted to place few of them strategically on stage such that his actors have access to the lines from any point on stage. I didn’t have the opportunity to witness the final result, but one of the actors confessed that the play was cut short by about half an hour due to missed lines. But the director was indeed grateful to his team of prompters. Their names were printed in big bold fonts on their commemorative brochure along with the actors. Although, all this prerecording started with the excuse that the audience cannot “hear the actors” in the school auditoriums and warehouses we perform instead of proper theatrical venues. To be able to act and listen (to the prompting) and speak is quite a bit of multitasking! 🙂 We folks take the easy way out and memorize the lines and act without prompters. 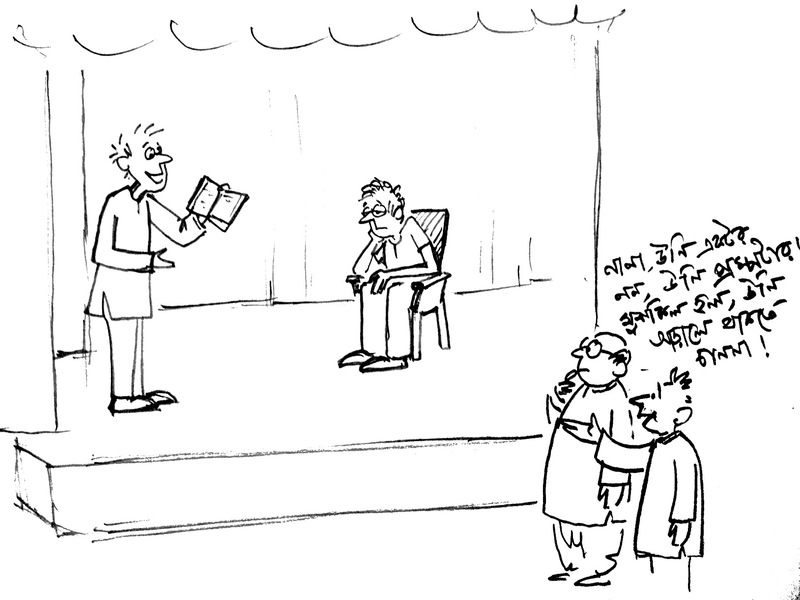 In fact, we end up memorizing the other lines as well (at least when one is on the stage), which helps in improvised prompting, lest someone stumble. A prompter complicates things for the actors, in my opinion.